Last week I was making Easter dinner (wait, I’ll explain!) for a photo shoot for the April Issue of Prevention magazine. 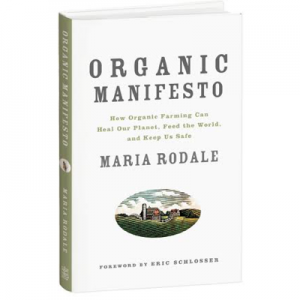 They are doing a story on my upcoming book, Organic Manifesto, and wanted a real Maria’s Farm Country Kitchen holiday meal to feature in their pages. 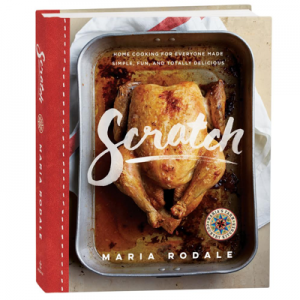 So, this being for a spring issue, I pulled out my seasonal recipes from this blog…which are also, by the way, all available on the Rodale Recipe Finder—search under Maria’s Farm Country Kitchen or use this link to see all the MFCK recipes on the Recipe Finder. Trim the ends off the red beets and put them into about 6 cups of water. Bring to boil and cook for about 20 minutes. Hard-boil the eggs and peel them. In a separate saucepan, take 4 cups of the cooked beet water/juice and mix it with the sugar, the apple cider vinegar, the cloves, cinnamon, and salt. Cook on the stovetop until the sugar is dissolved (no more than a few minutes on high heat). Put the peeled eggs, the red beet mixture, and a chopped shallot into a large bowl. Take the cooked beets and slip off their skins; slice the beets and add them to the bowl. Put the bowl in the refrigerator overnight. By the next day the eggs will be a gorgeous magenta color. These eggs are beautiful when sliced and added to salad. Or just eat them whole as a snack. They will keep in the fridge for three to four days. What great timing. I just asked at Wegman’s last night if they sell red beet eggs and surprisingly they don’t. I’d much prefer to make my own! Sounds good. I’ll give them a try. Hey Maria, it’s “gut”(good, in German)and pronounced like you spelled it. I’m married to a German man. I can’t wait to make this recipe! This sounds like something my family will really like! 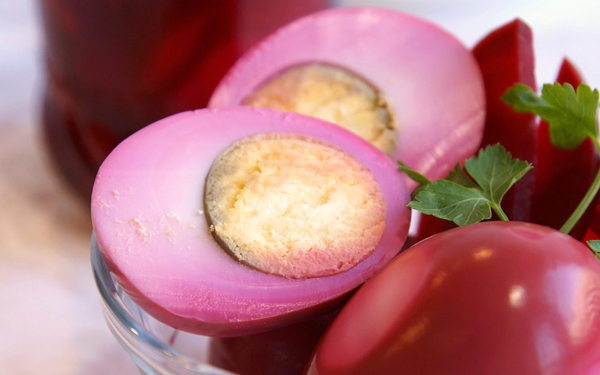 My grandmother always made pickled beet eggs when we were kids, though I know she used canned beets. I haven’t thought of these in 20 years, but with your recipe and my summer garden these will be making a comeback on my table!! Thank you, your site is so much FUN. I grew up in this area, and in my 20s moved to Boston, after 14 years, I relocated back to the lehigh valley area, and remember that wonderful day that I walked into my work place cafeteria and saw red beet eggs on the salad bar, those beautiful pink eggs……and thought aaaaahhhh, there’s no place like home!!!!! I might attempt a homemade batch. washington. I plan to try your recipe, sounds great. Love your email site. My father-in-law, who BTW is 89 years old, still grows his own red beets (lots of them), spends at least a week making pickled beets (lots of work for an old man), and has enough jars to last him and his family through the year and donate to his church. So, for me, all I need to do is wait till the jar is half empty, put some hard boiled eggs in, and enjoy red beet eggs…. Thank you so much for offering the recipe using real beets instead of canned. When I was searching for the recipe it was so disheartening to see so many recipes using canned beets. Also, your addition of cinnamon and cloves sounds very interesting. I can’t wait to try this. Try pickled beet DEVILED eggs….they are a tradition at my house! Being very Mennonite, I grew on on these things and my 83-yr old mother still indulges me by making them just to please me. She uses an old Amish recipe (crossed with what her Mother made in Holmes County, Ohio) that was calculated to feed a barn raising and cuts it down to family-size. Hi Maria, thanks for the recipe. Im going to try this and add thin sliced red onion and two garlic cloves to the mix and I might stir in ground cinnamon instead of the cinnamon stick. Making two dozen in a big ol’ ice tea jar 🙂 First time I think I will have had them with cinnamon and cloves but its for Christmas so here gos! I’m a Lancaster county boy that just started making red beet eggs in the past year. I work for a produce company and have all those goodies at my fingertips !! Can I substute gold beets for red beets? I’ve made these all my life, having been a Lancaster/Chester Counties girl, but have never made them with fresh beets, always canned. Now that I belong to a CSA and get fresh ones, I was happy to see this recipe. Also, now that I live in the South, it is fun to serve these and watch peoples’ faces, as they see them for the first time. Jay you can use gold beets. However instead of a beautiful magenta they are a less appetizing tan. If you make these ahead, the color and flavor will seep into the whole egg white. My family is from Pennsylvania, our recipe also calls for twelve peppercorns,two bay leaves and a cinnamon stick.